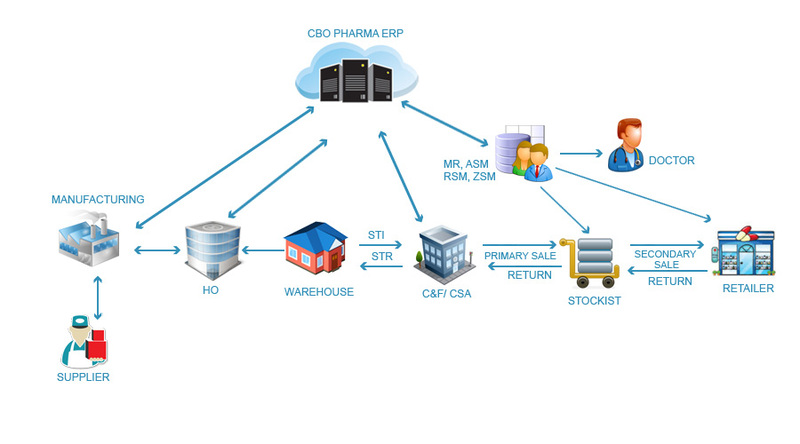 CBO Infotech is proud to introduce our Control Business Online Software to pharmaceutical companies. It is the fastest and most efficient way to manage each and every aspect of your business. Our Pharma ERP Softwares is specifically designed with the pharmaceutical industry in mind. It provides them with extensive information about every aspect of their business but at the same time, provide the information in a manner that is easy to understand. Our Pharma Manufacturing ERP Software uses an easy to understand interface so that many with will be able to use it with minimal training. CBO has a number of key features that differentiate of from the others. Our Pharmaceutical Manufacturing ERP Software is the only software that supports all 6 modules of a pharmaceutical company. Not just that, but our Pharma ERP Softwares is also capable of working online as well as offline. If that wasn’t enough, with our product, companies will be able to convert the necessary information into MS Excel in the event that they need it. All these features work in tandem to ensure that pharmaceutical companies are able to manage all facets of their business effectively, save time and generate increased profits. The six modules that our product can help pharmaceutical companies manage are manufacturing, distribution, finance, online net reporting, mobile & tablet as well as Online HR payroll. The market can be described as a very volatile environment where things can change in an instant. Due to the unpredictable nature of the environment, pharmaceutical companies need to be on their toes and respond to any fluctuations in the market quickly so as to maintain the margins. Control Business Online lets pharmaceutical organizations efficiently execute key important procedures quickly. With our products robust architecture, user friendly tools as well as industry specific functionality, pharmaceutical companies will be able to simplify operations and boost productivity which in turn will help drive profits. • Respond Innovatively To Rapidly Changing. • Adhere To Safety And Regulatory Requirements. • Manage production, planning, inventory management. Distribution of product is a vital stage for any industry. This is especially true for the pharmaceutical industry as companies need to ensure proper distribution of their product so that it doesn’t fall into the wrong hands. With CBO Infotech pharmaceutical distribution software, organizations will be able to better manage the traceability of lots, manage the recall of any product, track and control dangerous and restricted goods in and around the facility as well as manage the pricing of their products. CBO also offers available-to-promise as well as capable-to-promise capabilities, RMA processing as well as shelf life management while at the same time enhancing the inventory turns as well as bottom line profitability. It is obvious how important tracking of finances is to an organization. With CBO, pharmaceutical companies will be able to track all collections, payments and so forth while also build the balancesheet trail which will track profit and loss automatically. With our product, pharmaceutical organizations will be able to perform online reporting as well as business intelligence service that will help our clients easily analyze the data through insightful reposts and dashboards that will help them make informed decisions. It allows managers as well as heads of departments to create and share detailed and insightful reports in within a few minutes without the need to get in touch with someone from IT. CBO also offers mobile as well as tablet based solutions that enable pharmaceutical companies to report from anywhere they want. With our product, managers and heads of departments will be able to keep track of each and every employee under them though the use of smart phones that are enabled with GPS. This reporting is also possible to be done via SMS which allows for instant reporting. With CBO, pharmaceutical companies will get to spend less time on paperwork and spend that time supporting the company’s objectives. With our product you have a single source solution that offers you complete automation for employee data. It also allows you to all control and flexibility back into your company’s payroll process. It also helps you to achieve accuracy, consistency which will help you minimise risk. 6 in 1 (Manufacturing + Distribution + Finance Module + Net-reporting + Mobile & Tablet Reporting + Hr-payroll). 100% Master (Stockiest/Product/Batch Etc. Controlled By Head Office. Online stock transfer issue & receive by H.O. & CFA. Field force can view own Stockiest Ledger / Outstanding / Sales/ Targets/ Achievement . 500 + Reports designed and can be customized. Consignee wise sale & commission. One click show the outstanding / sales data net reporting.